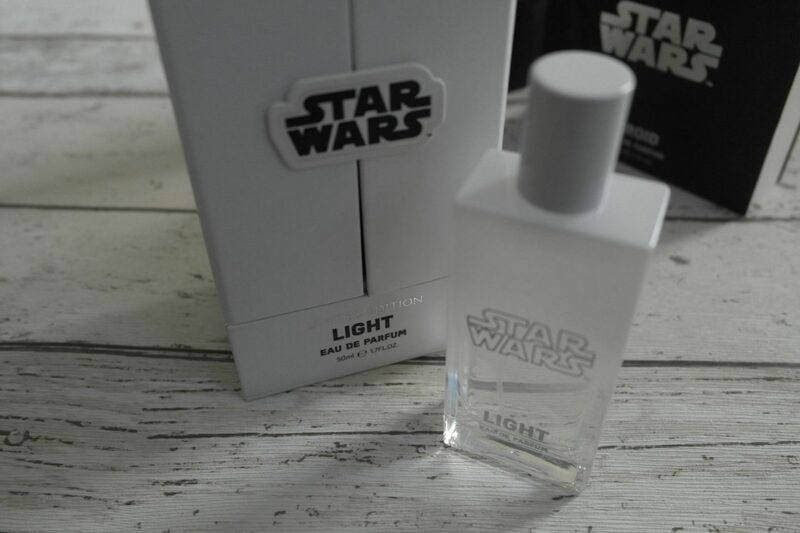 I’m not usually one to buy novelty fragrances, but I was recently asked if I’d like to check out some brand new Star Wars scents representing some of the popular Star Wars characters. As a big fan of the Star Wars films (should I be admitting that)? How could I resist saying no? I couldn’t wait to see what they were like! So if your a bit of a Star Wars geek or wannabe jedi, this post could be just your thing! 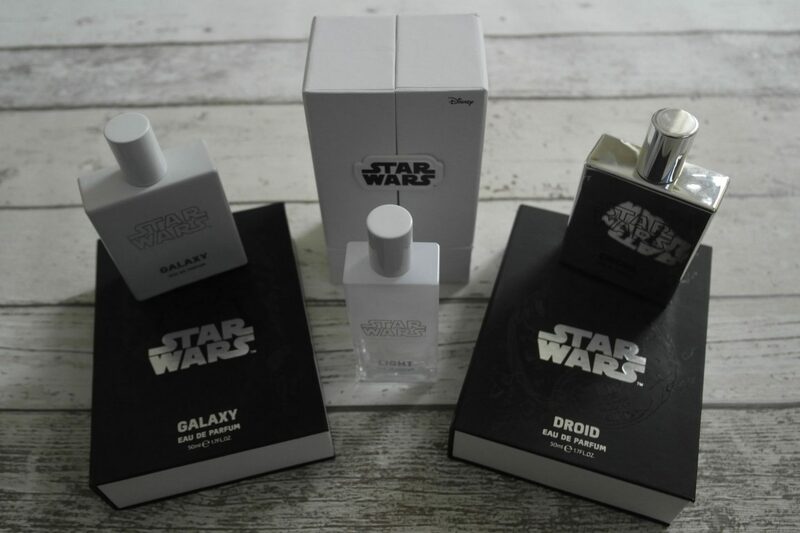 The Star Wars Fragrance collection are available in 6 different scents; Galaxy, Droid, Revenge, Rey, Dark and light. 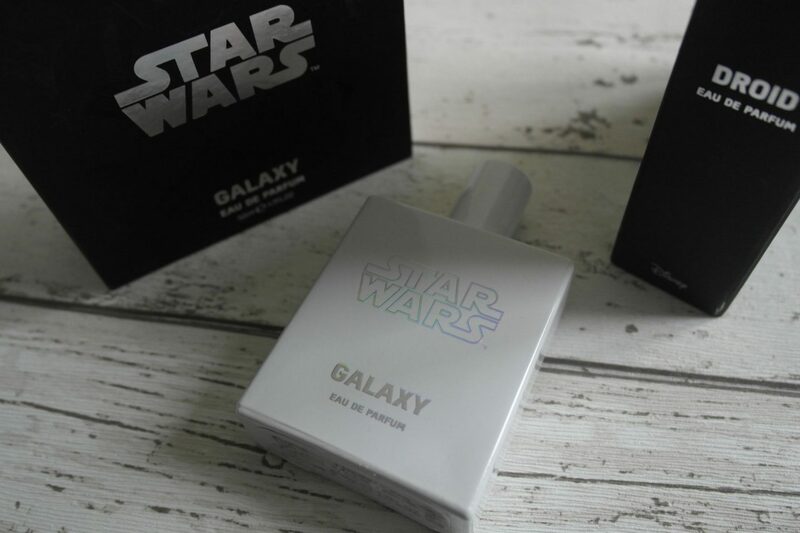 What’s more all of the fragrances are Unisex so you can share with the woman/man in your life or fellow Star Wars enthusiast! I received the Droid, Galaxy and Light scents, all 50ml (only size available). Can I just start by mentioning the branding and amazing looking packaging the fragrances come in. 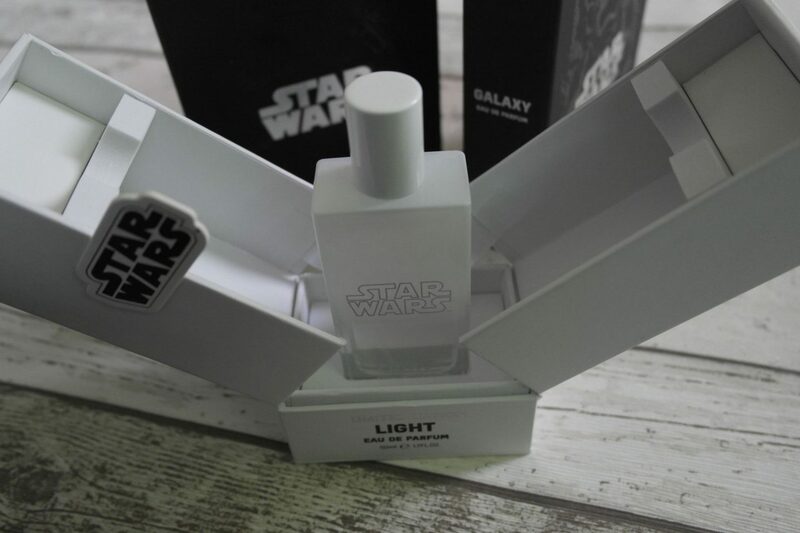 The Dark and Light fragrances have a clever Star Wars esque style opening box, which reveals the chic looking bottle inside with typical bold Star Wars lettering. The other 4 fragrances are presented in a nifty looking book with a secret compartment for the fragrance itself. Each one has a short story about the character and information on the notes on a separate page. The boxes make great keepsakes and wouldn’t look out of place amongst your other Star Wars memorabilia! Droid An androgynous, energetic, citric and floral fragrance combined with spicy and musky elements representing all that is precocious and good spirited. The fragrance opens with top notes of lemon and bergamot, spicy floral heart notes of lavender, violet and jasmine and musky woody base notes of musk, amber and moss. 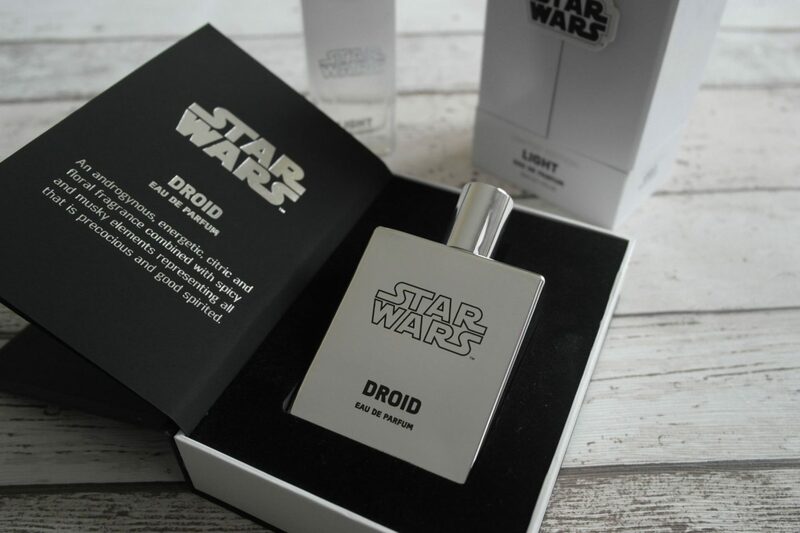 For me, Droid is a really nice light smelling fragrance and has a likeliness to a very popular unisex scent! It’s a really good daytime fragrance, I’d say perfect for office wear or casual afternoons out. Galaxy A zesty, energetic, woody fragrance with warm and floral spicy notes representing all that is fearless and heroic. It opens with top notes of orange and grapefruit, heart notes of violet, magnolia and rose and woody base notes of cedar, amber and patchouli. This is quite an intense and warming fragrance, the spicy and woody notes being most prominent making it ideal for evening. Don’t go mad with it though, a couple of sprays would be more than enough because of it’s intensity! Light A strong, fresh, pure infusion which enlightens the senses and refreshes the soul. It captures a warm ambiance and surrounds you in all that is good and inviting. The scent has citrusy top notes of grapefruit and lemon, heart notes of rosemary, cypress and cardamon and woody base notes of sandalwood, vetiver, patchouli, musk and amber. 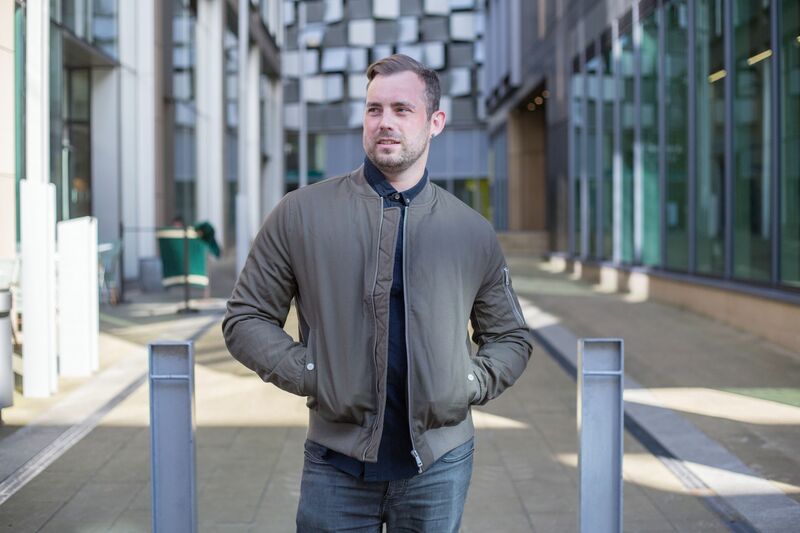 Its a light, refreshing and zesty scent, making it well suited for daytime wear. The Feel the force range of scents are surprisingly sophisticated for a novelty range, all would make gifts for all occasions. I for one would be happy to receive one. The longevity of all 3 fragrances I’ve tried are quite impressive, this is mainly due to the woody base notes in all the scents. They’re available to buy from Fragrance Direct and are very reasonably priced from £20 for the 50ml Eau De Parfum version. Have you tried any of the Star Wars feel the force fragrance collection? 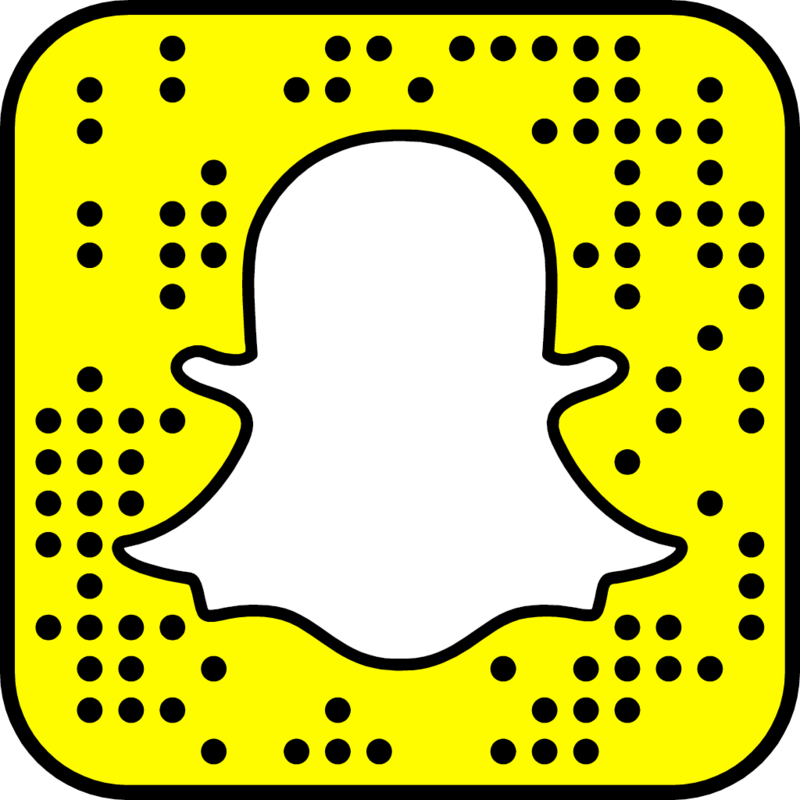 Let me know by commenting below. *These products were gifted to me for my honest review. All views and opinions are my own. I’ve never purchased novelty scents, nor would I be in a rush to start now, this one, however, I do believe would! purely for the Star Wars branding. Much like yourself, I do have a fondness for the Star Wars franchise. If not for this post I may have neglected to know of any existence of such product, either that or Obi-Wan Jedi mind tricked me into thinking these were not the bottles I was looking for. Oh my life I didn’t know these existed! I love Star Wars a little too much! All of the scents you have described sound fresh and ready for summer. The packaging is very cute and even when you get rid of the boxes the bottles are very easy on the eye! They would make great fragrances for summer! I even love the boxes, I just cant bring myself to throwing them away!